With over fifteen years of experience in shooting with Nikon equipment, I thought I knew quite a bit. Now video has entered my life and I can start all over again... The D800 is my first DSLR capable of shooting video and I am stunned by the quality it can deliver. Curious as I am, I've gathered lots of info on shooting video with the D800 and decided to share what I've found so far. Enjoy! How do I get a clean full screen hdmi output? How do I enable 1080p hdmi output on the Nikon D800/D800E? How do I get rid of flicker or banding in movies recorded with the Nikon D800/D800E? How do I get rid of aliasing and moiré artifacts shooting video on the Nikon D800/D800E? 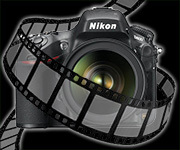 How large is the file from a 20 minute movie from the Nikon D800/D800E? What memory card type do I need for recording video with the Nikon D800/D800E? What memory card speed do I need for recording video with the Nikon D800/D800E? Should I use a stereo or mono microphone with the D800/D800E? What battery should I get for movie making, the EN-EL15 or the EN-EL18? How does the Nikon D800/D800E perform at high iso with video? How do I prevent autofocus and handling noise to be picked up by the microphone? How do I reduce preamp noise on the D800/D800E? How long can a video clip be when recording with the D800/D800E? Should I use 30fps or 24fps for recording movies with the D800/D800E? How do I enable index marking on the Nikon D800/D800E? How can I do about the rolling shutter effect on the Nikon D800/D800E? UPDATE: What is the best external microphone for the D800/D800E? Does the Nikon D800/D800E have an ISO sweet spot with video? Which autofocus modes are available during video? How do I set exposure for video - differences with stills photography? What is the best external monitor for the D800/D800E? About lilliputs, peaking filters and a zebra. How do I enable remote control for video? More to come, I'm learning new things every day. Drop me a line if you like! Questions & suggestions are welcome.